According to my meal plan this week, I was supposed to make curried chickpea salad for lunch. Well life happens and I ended up making it Wednesday morning to eat for dinner later that night when we needed something to eat on the go. That’s a perfect example of meal plans being flexible! I found this recipe on Whole Foods’ website awhile ago. I can’t remember how it came to my attention, but it’s been printed out and sitting in my recipe book just waiting for its turn. Below is the version I made. I didn’t have everything the original recipe called for, like raisins, cumin seeds, or cilantro so I just left them out. I did throw in some ground cumin to make up for the lack of cumin seeds. In a large bowl, whisk together vinegar, lime juice, olive oil, curry powder, maple syrup, salt and ground cumin. 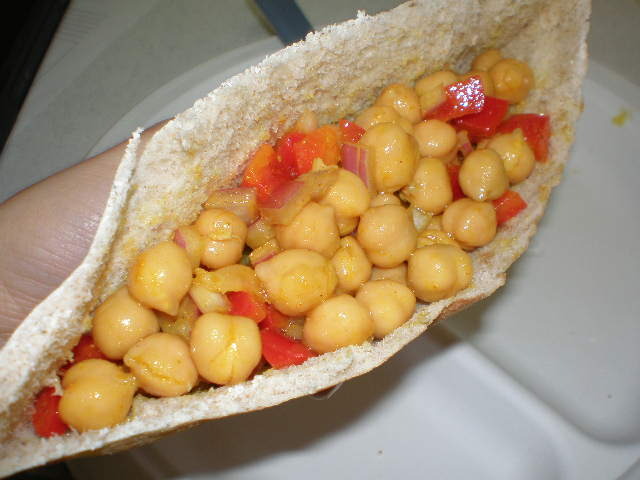 Add chickpeas, bell pepper and onion and toss to combine. Now from here you could serve this a number of ways. The original recipe says to serve it over greens with pita chips. Excellent idea I thought, however I didn’t have any greens. I did however have the pita bread I bought at the market last weekend. I decided to fill the pita pockets with this stuff. Sounds like a good idea right? Wrong! 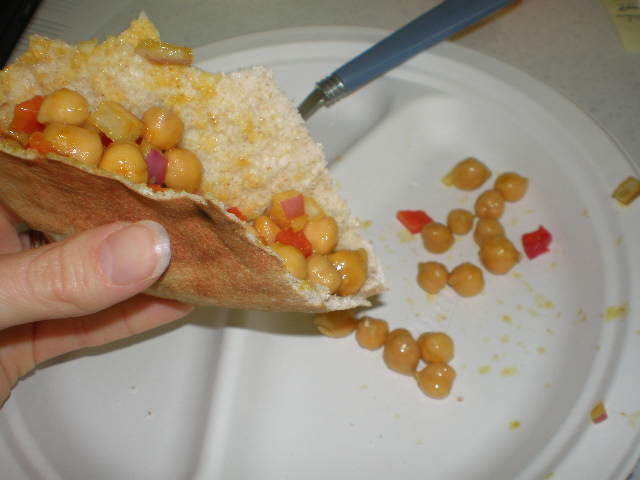 The chickpeas would not stay in the pocket. They bounced out all over the place. Out and onto the floor, the desk, the computer and my lap. Not sure if it was pita pocket user error or what. 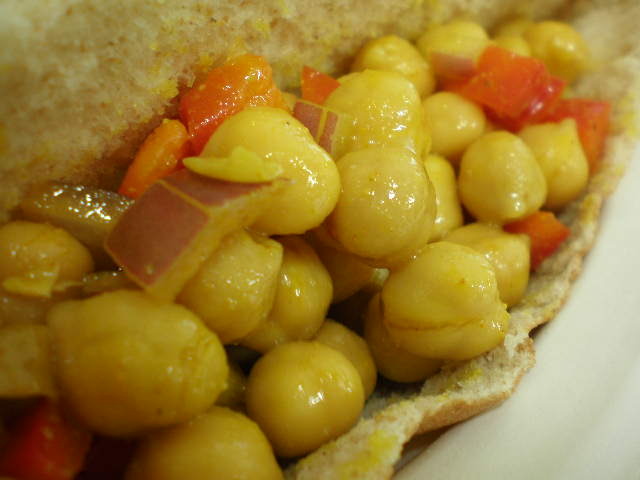 Despite the traveling chickpeas, I really liked this salad! I gave up on the pita pocket and just ended up eating it with a fork. I could definitely see myself eating this salad a lot this spring when lettuce is flourishing in the garden. It was really simple to put together, despite the long-looking list of ingredients. Don’t be intimidated! This is natural, healthy, delicious plant-based food. Click over to the original recipe for a much better picture than mine and to see the full nutrional data. Also, I really wanted to have a post up today about seed starting, but I haven’t had the time this week to start any seeds. It will probably be Sunday before I get around to planting them and writing up a post. If you are anxious to get started and don’t want to wait for my procrastinating bum, read this very helpful Beginners Guide to Vegetable Seed Starting written by Gayla Trail at You Grow Girl. Don’t forget about the March Challenge! Happy Friday! boil the water. Then add the sugar and stir until dissolved. Remove from heat and add maple flavoring (you can add as little or as much as you like). I love it! I make a big batch of it doubling the recipe and then put it in an old syrup container. It’s best if you don’t refrigerate it. Putting it in the refrigerator makes the sugar crystallize. We had some with our pancakes this morning! Hi Jen! I’ve never made homemade syrup before. I usually just buy it in a jug. I’ll have to try it sometime. Thanks for sharing!